One of my favorite things to eat is soup! Spring, Summer, Fall or Winter, I can eat soup all year long! As a side dish or a main dish, you can't go wrong. Please enjoy all of these Just A Pinch Soup favorites and share them with the people you love. To serve soup is to say, I Love You! The picture on the cover is Wisconsin Brats and Beer Cheddar Chowder and was submitted by JAP member Quinnn. The recipe is in the Soup N Meat section of this book. Thank you Tammy for that yummy stoup! I thought it sounded so good! I definitely want to try it! Thank you so much Noreen and Kathy!! I really appreciate the kind words! Congrats Tammy! Another great cookbook. 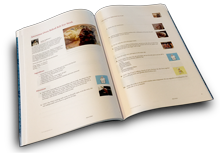 Tammy, thank you so much for using two of my recipes in your awesome new cookbook! Making good soup is an art, and you are the "artiste "